Sixty-one, sixty-two, sixty-three. Gasping, I counted our ski-steps up the massive wall of snow, pausing to rest at the sixty-third, one ski facing up the mountain and the other planted firmly behind, keeping the weight of our sleds from dragging us down the mountainside. The harness creaked with the 150 lb. sled held on by two straps at my hips. A colossal bank of snow looming overhead grew larger as we toiled upward, its fake summits causing a sigh every few hundred feet. Shadowy indentations and undulations marked crevasses threatening to swallow us up—or gulp us down—at the base of the pass. It had been surprisingly difficult gleaning information about Royal Pass. From satellite images we had known it would be a challenge. Memories of the hours spent poring over maps with Lynne flooded back. We shuffled up what had once seemed so impossibly remote. We were finally there, and just beyond lay the “ice highway”, as Lynne had dubbed it months before while viewing Google Earth—the flat 100-mile stretch of icefield separating us from our end point on the Bering Glacier. It was the fourth week of the journey. Jon, though ever positive, was downcast due to Lynne’s departure days before. Inchworming up the mountain pass, I thought of evenings just barely gone: Slow going. Sweet dripping off brow. Skin hidden from high elevation rays. Jon and I hadn’t been feeling well for a couple of days, knots gripping our stomaches and occasional extreme fatigue on my part. Jim had been airlifted out. We’d texted him repeatedly from our GPS Delorme to ask about his symptoms and recovery, begging news. There’d been no response. Illness had brought unabashed toilet talk. “How’d it go today, Jon?” I’d ask. ”Yeah, not great…” To be on the safe side (and because we saw no other alternative), we’d begun the course of Flagyl medication prescribed by a Seattle doctor in case of Ghiardia. Jim had been careless with water treatment back on the Slims River trail. ”Damn you, Jiiiim!” we’d shout to the snow mirthfully. But who knew what it had come from, and maybe it hadn’t been his fault. Days before our long toil up Royal Pass, we’d confronted another massive obstacle: Jon in the lead and Lynne behind, we’d crept up to a cradle between two small peaks after a harrowing steep descent amidst big cracks, our sleds threatening to go awol and drag us in. As I’d struggled upward, Lynne had whizzed past in a blur of bright blues. “What?” I’d shouted in disbelief. “How are you…!” I’d cried. She pulled ahead, giggling. Turning around, her bright blue sled had been just visible far below. “I got tired, so I left it!” she’d laughed, showing a row of straight white teeth. Laughter was Lynne’s modus operandi, and made everything more bearable. Nestled between two nunataks—towering rocky peak outcroppings in the middle of the icefield—a hush had fallen over our party. It would be the most awe-inspiring panorama of the journey, and maybe of my life. From our vantage point of over 9,000 feet, wind-swept snow lay in long pock-marked channels in all directions, mountains rocketing out of the white abyss. To our southwest crouched Canada’s highest peak, Mt. Logan. Southeast, the peaks of Queen Mary and King George. To our north, a long strip of mountains skirting the Hubbard glacier, which we’d follow south for the next few days before heading west over Royal Pass to reach the Seward Glacier and eventually, the Alaskan border. To the east, the series of small nunataks we’d followed up the Kaskawulsh glacier were just out of view. High clouds had laced the sky, and the unhurried northerly sunset had bathed us in pink light. I’d unfurled my mat and threw on a thick down jacket, getting cozy with my Kindle as Jon and Lynne skied down to the base of the hill to collect her sled. Those days, few things held more joy than kicking off ski boots and getting cozy with a good book, leaning against my lifeline, my sled. An hour had gone by in unbroken peace, until the faint voices of Jon and Lynne were just detectable over the ridge. Half an hour later, I’d finally called out. “Hey guys! It’s 8pm. Think we should get to camp?” I’d smiled as Lynne’s contagious giggling wafted through the cold air. There’d been no real hurry, after all, and I’d been elated at the magnificence, and at how far we’d come. “Be right there!”, Jon had shouted, just out of view. Two figures had emerged from the crest of the hill in a splash of bright blues jackets against the pink snow. “We just got engaged!” Jon had cheered. Radiant smiles on their faces, Lynne held out a delicate white hand with the ring Jon had been carrying in anticipation of this moment. ”Congratulations!” I’d whooped, lamenting my need to call out the late hour minutes before. In high spirits, we’d made it to the glacier camp frequented by glaciologists with various implements and tools for measuring changes on the icefield. We’d sat in chairs for the first time in weeks, warm in the cavernous tent erected for the winter months by the company who shuttled scientists to and fro, bush pilot Tom taxying back and forth whenever weather permitted. Though nice to see other people, we’d felt the unwelcoming stares of the proprietress of the operation, though we’d paid thousands of dollars to transport our teammates and gear to and from the glacier. The atmosphere had warmed up considerably when Jon produced a bottle of whiskey, but not enough to make us feel comfortable. Lynne had left us the following morning, and Jon and I had spent the day resting, despite having been behind schedule. I’d slowed us down a week before, shortly after Jim’s sudden departure. “Guys, I can’t go on today”, I’d said, feeling a hard pit in my stomach. They hadn’t questioned it, hadn’t pushed me to go further that day. We’d set up an early camp and I’d slept, feeling better after beginning the Ghiardia meds. With 130 miles to go, eagerness to make up lost time had taken hold. And while I’d felt stronger and more capable every day, hard times were ahead, and even harder decisions. “Sixty-three!” I huffed, pulling up short at the arbitrary number and bracing once again against gravity’s downward tow. Jon and I had taken our third rest day at the base of Royal Pass, staring up the flank of the massive embankment, scouting our line. I was raring to go, wanting to get miles under our belt and make as much progress as we could in the month we’d originally estimated for the trip. With Jim’s sudden departure, we knew we wouldn’t be able to finish the entire traverse, and at this rate, we were looking at a minimum of 45 days to reach the far end of the Bagley Icefield. Months prior, we’d planned his departure to coincide with us hiking off the upper Bering Glacier, with only what we could carry on our backs, over the mountains and onward to the ocean. With his early departure, we wouldn’t be able to afford a pickup of only our gear at the end of the icefield, a potential cost of some additional $2,000 dollars. Instead, we ourselves would leave from there, abandoning the last thirty or so miles of the journey. Even with this change of plans, we wanted to get as far as we could. And today, as we crossed over Royal Pass, we completed our 100th mile. But we were so behind track, and now that I felt strong, I was ready to take on more, push harder. Yet despite the medication, Jon was worsening. He needed more rest, slower days with fewer miles. At first I didn’t mind; he’d been so patient with me, and I owed him the same. And the short days were exhausting enough, so what was the hurry? We had plenty of food. And the dynamic had started to shift a bit. In the days after Lynne’s departure, Jon and I had begun taking turns navigating the crevassed terrain. I, the apprentice, slowly got better at keeping a straight line and navigating the hazards. His tutelage paid off. “Aim towards the peak of that mountain”, Jon would point, noticing our slow veer that threatened to add a mile onto our trek if unchecked. In the early days, we’d turn back to see my tracks leaving a lazy ribbon through the snow. Surveying a series of cracks ahead, he’d ask, ”Where do you think we should cross?” He’d speak as if to an equal. I’d point out the line I thought safest, and he frequently agreed, correcting me if I chose unwisely. The day after Lynne had left, we’d found ourselves in an utter whiteout, zig zagging blindly through a crevasse field from a glacier cascading into the Hubbard. Downy snow plunged steeply on two sides as we’d skied the tops of the ridges, a labyrinth of fog making visual planning futile and back-tracking frequent. The weight of the mist a palpable force, Jon had taken the lead, guiding us safely out. It had taken five harrowing hours. One, two, three… Reminiscing, we struggled up Royal Pass, the swish of ski tips taking turns sliding six inches past the other. We reached the top by afternoon, wind whipping at clothes. 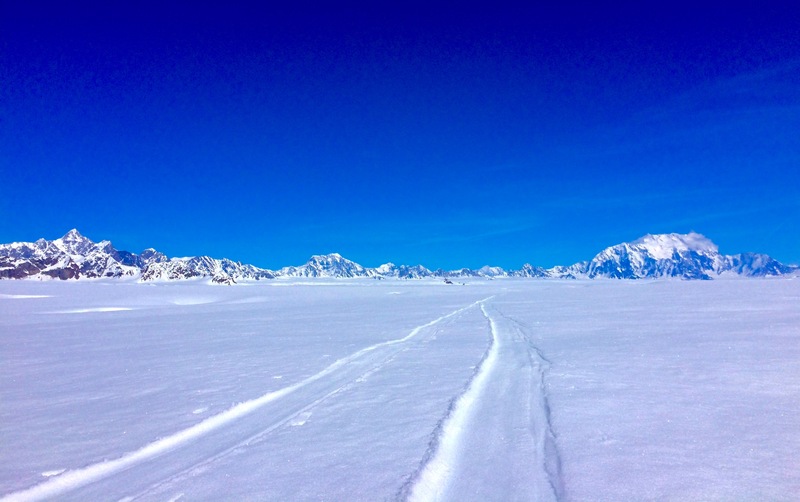 In the relative calm of the saddle, a quiet place was found behind a snowbank, and huddling against my sled, I munched on crackers and cheese and chocolate splayed out at my knees, staring absently off into the east; Somewhere out there lay the Alaskan border. On the far side of Royal Pass, progress slowed further. The “ice highway” we’d anticipated began with mile after mile of sastrugi, steep two-foot high corrugations rippling into the horizon. Where was our easy ice-highway? 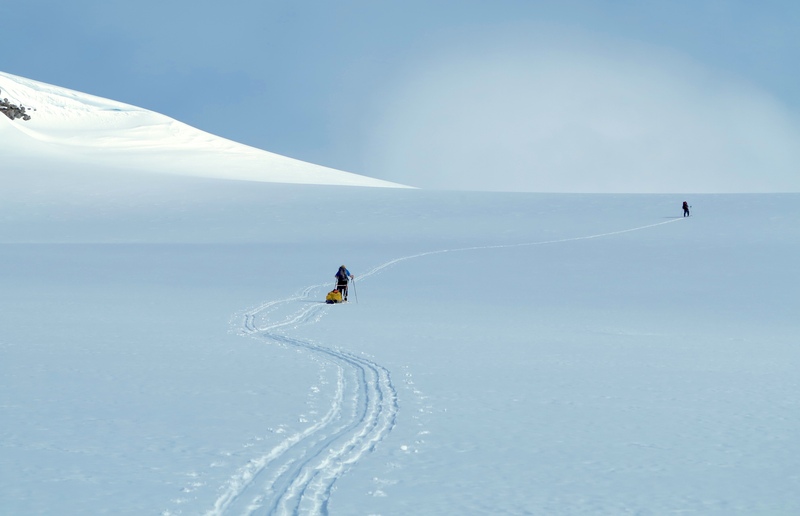 We heaved our sleds up and down, up and down, backs and bodies burning from the strain and sweat rolling down our faces, sunblock stinging our eyes. Jon’s condition worsened, and we were resigned to 3 miles a day. Worry took hold, and I finally spoke: “Jon, I can’t do this anymore”. waiting for the final chapter!